Sometimes the idea of decorating dozens of cookies can be daunting. I like to break it up a little bit. My favorite way to do this is making the icing ahead of time. Royal icing is great for this. Just make and tint your icing (I use gel paste food colorings). Press a piece of plastic wrap onto the icing...touching the top so it doesn't dry out...cover and refrigerate. 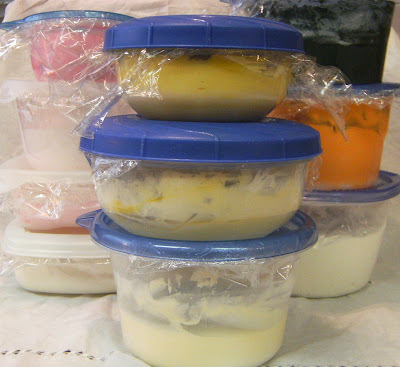 Before using, bring the container of icing to room temperature by letting it sit out on the counter. Stir and you are ready to decorate. Keep in mind that icing made ahead of time will darken a little. This is really helpful when trying to make a dark color, like red or black. 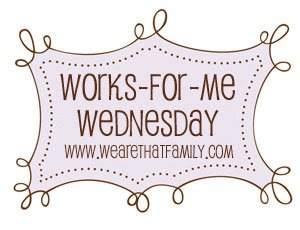 Hop on over to We Are THAT Family for more WFMW tips! First, a question. How long will the icing keep in the fridge? Second, I like your taste in beer! If I am ever on the ball enough I love having it done early. But...I usually am not and then spend a long time making cookies. I keep my royal icing in the pantry...says it will keep up to a month. Never had it that long though. Thanks for that plastic film idea, Bridget! Royal Icing is my favorite icing, but I never knew you could refrigerate it and have it keep. Thanks so much! i just haven't figured out the trick to getting royal icing to taste good! any suggestions? Multi-tasking Mommy...I think the brand of meringue powder really makes a difference. I use Ateco and think it tastes the best. I also add a few drops of extract to my royal icing. One more thing...I really like AmeriColor and Spectrum food colorings. They don't have an off-taste like some others. Yes, it does really help to make the icing ahead of time. I use the meringue powder from Williams-Sonoma. Once I tried the Wilton brand and it had a funky smell. I love this idea. I always dread having to make so many different colors of icing...have you ever frozen cookies already iced? If so how have them come out? I have frozen them without the icing and they were great. Your cookies are gorgeous! That is such a good tip- i need to plan ahead more haha! Is that for beer cookies? Because beer bread is delicious! p.s. Baking for me is like bowling. It's bound to be more fun with a little beer. Love your cute little containers of icing tucked in between the beer!! That's the only brand hubby will drink! I was under the impression that royal icing shouldn't be refrigerated? Hm, thanks for the info.....I knew I shouldn't have believed her! I had no idea you could make icing ahead of time and put it in the fridge! I feel so much less rushed. Thanks.